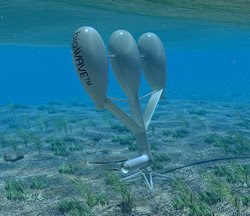 The wave power system, bioWAVE™, is based on the swaying motion of sea plants in the presence of ocean waves. The hydrodynamic interaction of the buoyant blades with the oscillating flow field is designed for maximum energy absorption. In extreme wave conditions the bioWAVE™ automatically ceases operating and assumes a safe position lying flat against the seabed. This eliminates exposure to extreme forces, allowing for lighter designs and substantial cost savings. Systems are being developed for 250kW, 500kW, 1000kW capacities to match conditions in various locations.